It looks like something out of this world, but that’s exactly where it would work. 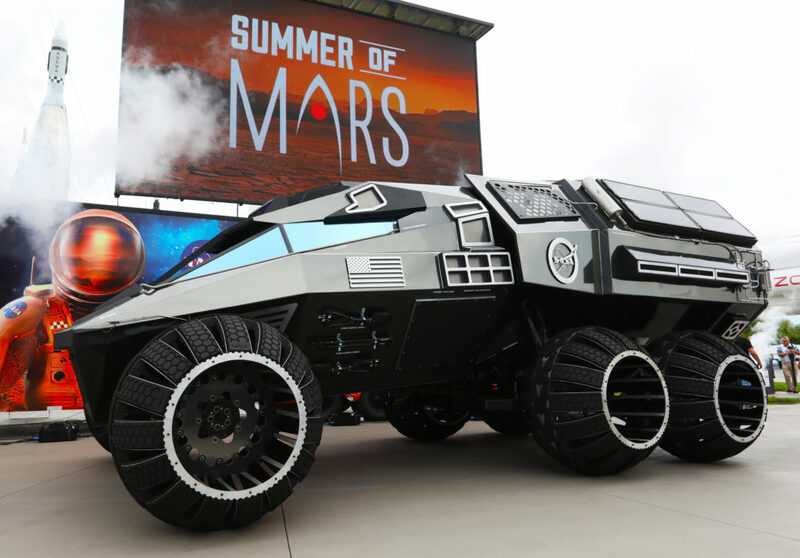 A futuristic Mars rover concept vehicle was recently unveiled at the Kennedy Space Center Visitor Complex with a goal of inspiration and education as NASA continues developing plans for its journey to the Red Planet. The visitor complex kicked off its “Summer of Mars” promotion with a June 5 ceremony which included former astronaut Scott Kelly. During his appearance, Kelly shared some of his experiences during a one-year stay aboard the International Space Station from March 27, 2015 to Feb. 3, 2016. According to Rebecca Shireman, assistant manager of public relations for the Kennedy visitor complex, the “Summer of Mars” program will provide a survey of NASA’s studies of the Red Planet. The builders of the scientifically-themed Mars rover concept vehicle, Parker Brothers Concepts of Port Canaveral, Florida, incorporated input into its design from NASA subject matter experts. Construction of the Mars rover was commissioned by the Kennedy visitor complex without use of taxpayer dollars. The rover operates on an electric motor, powered by solar panels and a 700-volt battery. The rover separates in the middle with the front area designed for scouting and equipped with a radio and navigation provided by the Global Positioning System. The back section serves as a laboratory which can disconnect for autonomous research. While this exact rover is not expected to operate on Mars, one or more of its elements could make its way into a rover astronauts will drive on the Red Planet. Following several weeks on display at Kennedy’s visitor complex, the Mars rover concept vehicle will be displayed at several locations. From July through August, it will be displayed at several locations during a tour along the East Coast. Shireman explained that the Mars rover concept vehicle will return to the visitor complex to be part of the new Astronaut Training Experience attraction opening in the fall of this year.